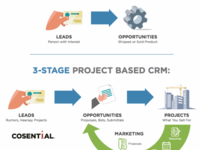 #1 CRM Solution for Commercial B2B Construction Firms (non-residential). Specifically designed around project cycles, mapping relationships and marketing your experience. Map & manage unlimited data about prospects, bids, repeat clients, supplier relationships, partners, leads, opportunities, projects, personnel, and firm knowledge throughout a project's entire life cycle. Take a demo with Cosential and see first-hand why it's the flagship CRM for B2B commercial construction firms. Pros: Cosential has streamlined many of our processes, and has the potential to help us automate our proposal process even more. The potential is amazing. Cons: Glitches! We seem to be always taking three steps forward, two steps back. Cosential isn't easy to set up or implement. There is a ton of up front work and training to be done. After overcoming all of that to be faced with modules that stop working and aren't fixed timely we are left hanging. Overall: Cosential has streamlined our processes and has the potential to help us streamline even more. The company needs to evolve it's development staff to be able to address bugs in a timely manner. Pros: We now have one central data depository for all of our offices contacts, project info, personnel, resumes etc. The ability to create custom reports, update project data and track prospects across many users has improved our communication and reporting tremendously. The ability to update personnel, project, contact information in one spot and have it populate throughout any report or resume is a big plus. The Widgets are great for a graphical representation to management that accurately represents current pursuits, hit rates, wins by market, etc. The ability to turn on and off modules for user groups is huge! It keeps people from being overwhelmed when they first start to use the CRM, especially if they never have used one in the past or are skeptical. Integrations with other programs continue to be developed and improved by Cosential - this is a huge plus! Business Development/Marketing people are mobile - the iPad is a tool, just like a laptop. Being able to enter client info in Cosential and add it to an individuals Outlook contacts with just a few clicks makes it easy to have centralized client data. We will be implementing an integrations with Vista later this year. I am excited for the potential that will bring live project and personnel data to our CRM! Cons: It's still a little 'techy' and driven by IT/Developers from the end-user perspective. But it's getting better every month we use it! When a bug is identified, or an issue occurs, for the most part Cosential Support is responsive. Sometimes, however it seems like it takes months to fix an issue. This is especially frustrating when a function (say a mailing list) was working correctly and then stops working. Because Cosential manages literally mountains of company, contact, personnel and project data, it can feel overwhelming to new users. Customizing the training and 'easing new users into' the program based on their needs is the only way to get good buy-in from apprehensive or skeptical users. The mobile app has it's limitations on the iPad and as all of our Business Developers use iPads, they would like to see the app developed further. Right now, it's better than nothing when they are on the road! Pros: Because Cosential was designed by marketers in our industry, they know what information is important to collect, track, and analyze. The organization of the information and ease of use of the system is unparalleled to other CRMs/databases. Cosential is constantly updating and enhancing the system, so there are new, and improved, features being released to its users constantly, and I always hear what's going on - I know it's the top of the line database for information junkies like me. The reporting and template publishing tools are also incredibly helpful. Tracking our proposals and showing our win/loss ratios to senior leadership has been crucial. Also, the ability to store less-than-popular data for possible future use is highly beneficial. Cons: I wish the reporting module was a little more user friendly - it can be daunting to new and novice users causing it to go unused and frequently used incorrectly causing frustrations. I am now in the Commercial Real Estate industry (more so than what would be termed AEC), I would love LOVE to have more information/modules relating to development of projects, property and asset management - understanding the high-level of property and information turnover for these types of services. Overall: I was first introduced to Cosential in 2010 and began to research and push for the software at my previous company. After a long inside sales process, the company decided not to move forward with my recommendation which was a major factor in my leaving that organization. One of the main goals of my coming onboard to my current company was to implement Cosential as our marketing database software, and see what other tools are available that we can utilize in other parts of the company. We are full-service real estate company that provided construction (at the time), development, financing, tax credit syndication, facilities maintenance, and property, asset, and investment management services. We ended up implementing across all marketing groups in the business in the construction, development, investment, asset and property management, and in our justice division. Different groups adopted it more quickly than others, and some we ended up just removing entirely as they were not utilizing the system. Currently our marketing groups across the business still utilize Cosential for business development tracking, current project and property data collection and maintenance, and personnel resume maintenance. Recommendations to other buyers: It's the best in the industry, but implementation (as with any software), can be very time consuming and overwhelming. Depending on your level of implementation, I would highly recommend a dedicated employee to this endeavor, and then can become the go-to Cosential person/administrator for the system ongoing. Even after implementation, you need to understand any database is only as good as the information that goes into it - so constant maintenance is imperative to keep the system updated and accurate. Thank you for this feedback and your advocacy! We love to hear the validation of our purpose: providing the best database tool that truly knows the AEC space and consistently driving for innovation. When it comes to reporting, implementation we hear you, part of housing so much data for inquiry is also a large number of ways to summon it. We're always working on the UI for ways to improve, as well ensure we remain extremely approachable for assistance should you need it. On project management, we work hard to have API implementation with softwares that focus on development of projects so that you can combine those views and measure turnover - please get with us to ensure you are taking advantage of existing integrations that may exist you may not be aware of. If we're missing one, or ways we can have modules accomplish something our customers can benefit from we'd love to evaluate that for future feature enhancements, as you mentioned we're very passionate about! Pros: I like that Cosential has implemented upgrades in speed and search functions. It is tailored to the A/E/C industry, and we have the ability to customize fields. We use Adobe InDesign for proposals, so the ability to generate resumes and project profiles directly into InDesign templates is a big plus (it can also be done in MS Word). The dashboard widgets are really helpful for our business development team. There is a phone app available. I am getting good service regarding support for re-implementation. Cons: The report module is always a challenge, the interface is cumbersome and it usually takes multiple attempts to generate the data I am looking for. It is not forgiving for variances in naming conventions. Customer support relies on just pointing you to a video. I have put in tickets for fixing issues and never hear back. Overall: My company had implemented Cosential about 3 years before I joined, and they did a good job of inputting the bulk of project, personnel, and contact info into the data base. By the time I came on board the staff that had implemented had left, so I received minimal training on administration of the system, and how all the pieces fit together. That being said, it has not been difficult to learn the basics, and I am currently in the process of "re-implementation" to establish standard work flows and systems to manage the data input, user training, report management, etc. The biggest challenge is carving out the time for data input and cleanup, not to mention bringing new modules (surveys, marketing, etc.) on line without having a full time data base manager. Recommendations to other buyers: If you are in the A/E/C industry this data base software is geared to meet your needs. Allocate adequate hours to keep it maintained, have buy-in from management. It is a huge commitment, but as far as I can tell, beats the alternatives. Thank you Nora for taking the time reviewing Cosential! We work hard for your business, and delivering value to A/E/C teams as you spoke. Honored to hear how our fields and proposal automation works well for you. On the report module, fair feedback and our developers are making changes very soon so stay tuned. We've hired new support director and team, you should be feeling great improvement in support now! The new team has improved response times, follow up times and edited/updated knowledge articles. Pros: Cosential gives us quick access to all our past proposal information. Our marketing team is quickly and easily able to access past proposals for guidance, develop intel about our history with clients and understand our experience in a region or with a certain service. As a firm with over 25 offices across the country, this information is vital to our team. Cons: While Publisher has come leaps and bounds from where it was originally, we would like the ability to create several resumes at the same time. For example, I'd like to select several employees, choose a template and have the system walk me through each employee to choose his or her projects. Overall: KCI has been with Cosential since 2007 and have watched the system expand to meet the needs of industry. While we do not use every function the system offers, we rely heavily on it for proposal tracking, proposal generation, customer information (hit rates, history, contacts) and firm qualifications (projects and personnel). The Cosential team has never lost sight of what it is that makes them successful which is involving industry in their roadmap for enhancements and functionality. These folks listen to what we need and respond. Recommendations to other buyers: By far, Cosential is the best option for A/E/C industry. It is customized for our industry, understands what we need to get our jobs done and the team at Cosential is constantly looking for ways to help us do our job better. Pros: 1 year after purchase: This has easily been one of the wisest investments our firm has made. The ability to track customer information (CRM), their experience, past performance data, and leads/opportunities all from one simple application and dashboard makes my 1-man marketing team feel like 3. The capability to routinely pull data from our accounting software reduces duplication in both content and time. I no longer spend hours "looking for *stuff*" (put politely) during proposal preparation due to the full featured project and 'knowledge' database paired up with the advanced reporting functionality. I still have only scrapped the tip of the metaphorical iceberg of features that are included with the package including the ability to automatically survey clients, a built in email marketing tool, card scanner, countless plug-ins, a customizable RESTful API, Outlook and Exchange server plugins, and soon a full blown Zapier integration. Additionally, the support both during install and throughout my journey have been absolutely wonderful. They have made the ins and outs of using the software a simple, and surprisingly enjoyable, experience! Cons: There are some issues with the knowledge base section that I would improve on. I have a lot of issues it the mobile application on my Android device. Pros: My favorite feature is the resume generation tool. The ability to produce multiple resumes tailored for specific pursuit types automatically updated each time they are created is beyond wonderful. Coupled with their availability to all team members 24/7 at the push of a button from any internet enabled device makes the resume generation tool peerless. Another great feature is the opportunity tracking, once again keeping all the pieces of a pursuit in one handy place and available 24/7 is brilliant!!!! Cons: Although a minor issue I do wish that users other than administrators could upload templates for use in the publisher module as administrators may be busy/unavailable for periods of time making updating the templates a longer process then it should be. Overall: Labor hours saved is huge. Access to information from one portal extremely helpful. Pros: A place for everything. Cons: Load time has been a factor, but it has improved significantly over the past 6 months and I know their developers are actively pursuing even greater speed. Overall: I love how easy it is to access and analyze our information. Cosential has a home for every data point you can imagine -- and the flexibility add new ones as needed -- so you can store and recall information about all of your pursuits and projects. Our biggest problem prior to using Cosential was that knowledge about our projects, clients, past pursuits, etc. lived primarily in the heads of our people. That's fine as long as no one leaves and no one forgets...but that clearly isn't reality. Cosential is a robust, interconnected database that allows us to have literally everything in one place, and we can view that information from multiple perspectives. Recommendations to other buyers: Be sure to work VERY closely with your implementation specialist. This can be an intimidating software package and needs to be populated and launched by someone who fully understands the system. Pros: easy access. online. quick. It is a thirll when i am looking for information about a project, or a person's title and the info is there. Linkedin is good, as a back-up, but my database is better for me. Cons: the reports creation can be tricky. sometimes i pull in inactive or unknown and sometimes people seem to disappear and need to be pput back. sometime hard to find where to add a company. Overall: This software provides a snapshot of our company, our projects, our employees past and present and of course our work, and teams we have worked with. Thank you Lynn for these great marks! We're very happy to be the reliable database that makes things easier for your day to day! We would love to help you with any features you need help with like reports and adding companies, email us at support@cosential.com and let us schedule a 1:1 to see what is going on, how we can help! Overall: I use Cosential literally every single day...and that's not just because I'm the OFA but because it's so easy to upload information and documents. I use the personnel, projects and opportunities modules almost daily. Being able to reference so much information for a project we may be mentioning in a proposal is very helpful and makes my job a lot easier. Thank you for the kind words, and your being a fan of the solution. It fuels us to hear how we save you time in the proposal process, making your job easier is our job ! On the tendency to run slow, That is absolutely fair feedback and we're on it! We've purchased more servers in addition to optimizing the application. We're already seeing great improvement and very near upcoming updates are focused on delivering much faster speeds. The support from Cosential cannot be beat. Pros: Completely transparency of our customer opportunities and interactions between all our divisions for all customers. We have robust reporting where we can understand our pipeline, hit rate, and more data than we ever had in the past. The process is simple and we have the power as the admins to make changes/updates without having to wait for the resources at Cosential. We feel very empowered! Cons: The time between request (issue or bug with system/enhancement suggestion) to the sprint where the improvement may occur. At times you are waiting for the developers or the request sits in the queue between submitting the suggestion and update for quite some time. We have learned the process of a bug or enhancement but at times we wish we could influence more of the speed to updates. Pros: The fact that Cosential is specifically designed for the A/E/C industry is vital. Cosential is a rare find because it was built by A/E/C marketing professionals with a profound understanding of the industry, its pain points, and its business processes. That knowledge is reflected in key features, implementation, and support, as it is a system tailored to industry best practices. 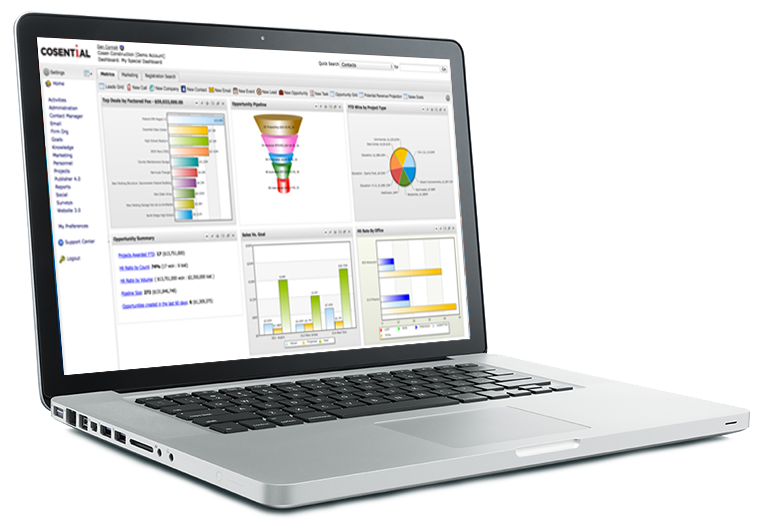 Users of Cosential view the system as very customizable and are able to adapt it to fit their specific needs. Cons: Cosential has come a long way in the eight years that I have been using the system. They have grown quickly and have rolled out great new features. With that said, sometimes I think the new features are focused on a little too much, and the current bugs or enhancement requests are left behind. Dan, the CEO, listened to his users, took this to heart, and announced at the last conference that he has brought on developers to clean house and improve what is there already. I feel that is happening, especially as I read the monthly updates. Recommendations to other buyers: Regardless of the system you decide to use, always remember that software systems do not and will not self-monitor, solve problems at the push of a single button, or remedy all your aliments. Most importantly, the CRM system will never eliminate thinking! Someone must take ownership of the content, put best practices in place to safeguard the system, and champion it along with the idea of what a successful CRM is and can do for a firm. A decision on one software over another depends on the needs of your firm and the goals you have in using a CRM system. Good luck in your pursuit of the right CRM software for you and your firm! Pros: After researching many CRM platforms, and test-driving three, we decided on Cosential. First, it is developed by someone in the Architecture/Engineering/Construction (AEC), so we would not have to tweak anything to jump in and use it every day. It is our new repository for all kinds of data on projects, and employees (their projects, sortable in many ways), which will help so much with not having to look through old records of all types in various places in our network and on paper. We do a lot of public works projects, and in responding to RFQ's/RFP's, the information asked for increases all the time. We run lean and mean here, so any way we can save time is invaluable. Cosential is very intuitive and easy to use, which was the second reason for our purchasing decision. The training and tech support is user-friendly for busy people. Thanks Cosential. I would rate everything a "10" but I'm still pretty new at it, so I'm giving mostly "9". I can quickly schedule my training online by looking at my trainer's calendar, so if I have an hour free I can make good use of my time, and with one click it's in my outlook. If, due to deadlines, I need to cancel and reschedule, I can do that too. Cons: The only thing I don't like is nothing to do with Cosential, we are learning how to input data and put all our records into the system. Recommendations to other buyers: Try software before you buy. Everyone will give you a free trial. Before you start, develop a decision matrix of what is important to your decision. We did not want to have to configure software for our specific use, we wanted something affordable, with ease of use, and good training and tech support. Cons: Not intuitive - improved UX/UI could improve this; The help section is not very detailed. Overall: A good system for integration- user interface/user experience could be more solid. 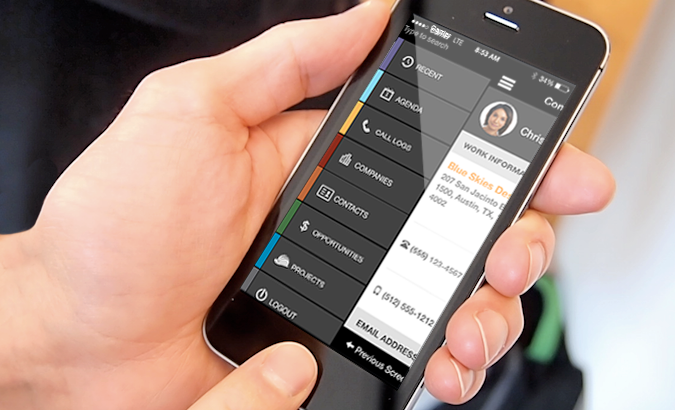 A more intuitive interface can help users navigate, update, and understand the CRM with ease! Recommendations to other buyers: Improving the UX/UI could help make it more intuitive for users. Adding depth and detail to the Support Center can result in a lot fewer confusing scenarios and calls to support as well. Thank you for taking the time reviewing Cosential! We're proud to have earned your business. On intuitiveness, we're always listening to our clients and making updates weekly so please let us know where you see room for improvement. We've hired new support director and team, you should be feeling great improvement in support now! The new team has improved response times, follow up times and we're editing/updating knowledge articles every day. Great web-based software for AEC industry. Very good for firms with multiple locations. Pros: Web-based, seamless integration from legacy system. We spent about three months transitioning from ACT! to Cosential. The customer support was fantastic and after the on-boarding, I was given another excellent customer service rep (a real live person!) who returns my calls! The dashboards give me immediate data to share with CEO and CFO. I can also get custom reports written for my data. Cons: Mobile App and e-mail marketing could be better. The e-mail blast program is a little clunky. The mobile app has limitations and this is going to need to be addressed. But overall the program is fantastic. Comments: I had a great experience working with the Cosential program, customer service, and my professional services consultant. Everyone was always willing to help with any questions or issues. Any issues that arose were resolved. Timeframe on getting them fixed was dependent upon the complexity of the issue. Cosential is always expanding and improving their software, building it towards their client's specific needs. Pros: The data entry was simple and having the ability to interlink and add information to a project makes access easy. The capabilities and possibilities with Cosential are almost endless. Cons: The wording of the criteria in creating a report does not always match what is in the data that has been entered. Also, the choice of further filtering can be a little confusing to figure out, but once you do it is not too hard. Cosential has helped standardize our information across the company. Pros: Cosential helps us standardize the information we track, being able to output reports in a consistent format. Cons: We use InDesign for our publications. The Publisher module currently forces us to export resumes and projects one by one, vs. being able to select projects we want to use and exporting all into a single file. Pros: Data organization is great. Unlike other CRM solutions you do not need an outside programmer to customize. In fact the software is so robust in pre-loaded features implementation is more of subtraction process to hide modules your firm may not need or use. Field customization to match our firms processes and terminology was pretty straight forward. Cons: Some newer modules (marketing e-blasts) are in their infancy, and work like their in their infancy. Generating reports and automatically generated reports (workflow) are not as intuitive to create as I would have liked and can be difficult at first. Mind you my implementation specialist Amy was always there to help me get the reports to do what I needed. It just takes some time to learn Cosential' s interface for this. 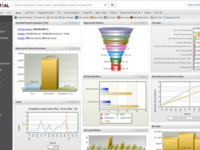 Overall: Cosential is a great CRM solution. Their implementation team made data import from multiple different sources an easy to understand and execute process. Any questions I have had along the way we're responded to very quickly. Pros: Very customizable system for verbiage to adapt to your company's terminology. 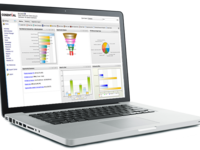 Extensive reporting capabilities allow you to refine what data results are returned with full control. Cons: The system can be intimidating to new users, specifically those with minimal computer experience, but is fairly intuitive once you are familiar with the program. Pros: The CRM portion of the product runs fairly well for the Construction market although record retrieval can be slow and there are a few procedures that cannot be performed using Chrome on a Mac. Overall we are pleased with the CRM functionality of the product. Cons: The email functionality is not good. The Test Email command for email blasts doesn't work and is a known bug yet the command still appears in the screen. Email templates literally take minutes to open. You can't add internal personnel to a test email list. CC'd emails don't actually get sent. Variable tags don't work. Yikes! The good news, according to our Customer Success advocate, is that the company is aware of these issues and is aggressively working to address them in early 2019 so you may want to check the latest product features when considering the software. Overall: While Cosential is helping us get a better handle on our proposals and sales pipeline via its CRM functionality, it falls short on the Marketing Automation side at this time (early Jan. 19) especially relating to email capabilities. Their Support team is very good and has done an admirable job of addressing our frustrations in a positive, transparent and pro-active manner. We are cautiously optimistic that these issues will be resolved by the end of 1Q19. Cosential - Work SMARTER Not Harder! Comments: We used to have to pull and drag project information out of our Project Managers after their projects were completed, while they were already working on a few others.... Now with the workflow and Financial Data Connector, we are able to sync our financial projects directly into Cosential project records and pull relevant data real-time. 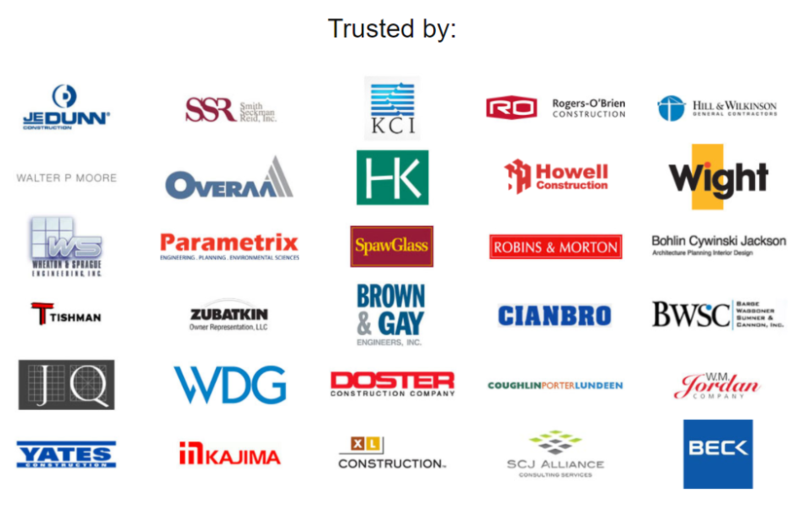 Pros: Built by and for the AEC industry. The workflows are a huge time-saver and allow us to capture the data we need to make our systems function. Cons: Nothing major - I love their reports, but they can take some getting used to. Recommendations to other buyers: You will need a Cosential Champion and they will need support from the top! 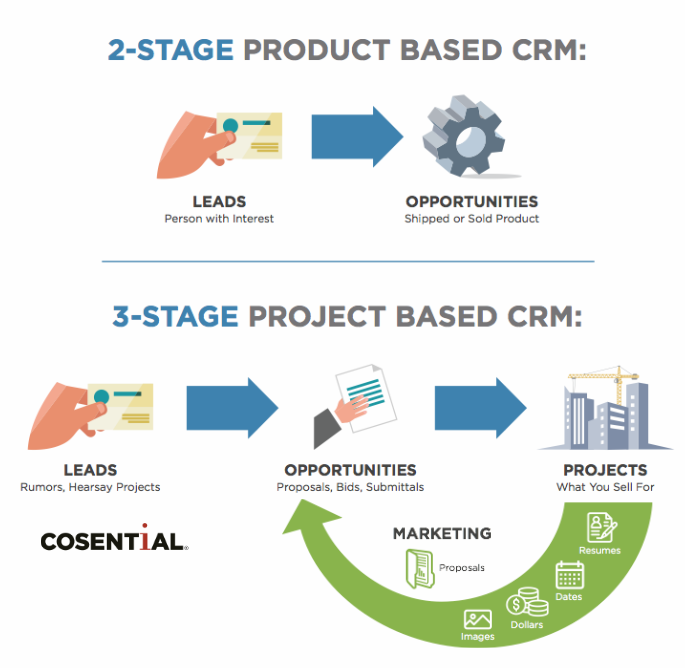 If you are an AEC firm, Cosential is the way to go for a CRM. Pros: It geared toward the Architect/Engineer/Construction field only. Customer service is wonderful!! Cons: A little dated and a fully functioning app (right now it is just limited). Recommendations to other buyers: If you are an AEC firm, I highly recommend this software. Comments: I look forward to learning the software completely and being able to take advantage of all the great features that Cosential CRM has. Pros: I like how it can captures and links so much information between clients, contacts and opportunities. Cons: Some features are still not working correctly and/or they are replacing with different features but I'm finding there are lots of issues still they haven't worked out which can be frustrating when learning a new system. Great tool for General Contractor Marketing/Business Development! 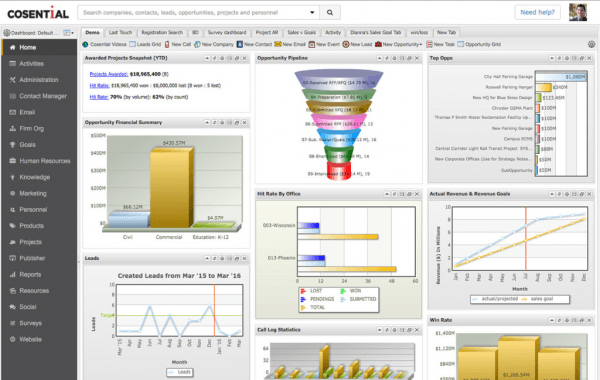 Pros: The dashboard and workflow system are excellent tools. As a very visual person, the ease and impact of the dashboard widgets are a great. Seeing your information in charts and graphs really help to monitor our marketing progress. The automated alerts and notifications from the workflow system are excellent as well. Easy and efficient way of letting the team know when there are new prequals, awards, proposals, etc. Cons: There are a couple of areas that would be better suited for our needs if the customization was available. But all in all, the program works great for us and is getting our tracking on track!! Recommendations to other buyers: The whole experience has been a breeze. From the first sales contact to the support team while setting up the program to fit our needs has been amazing. 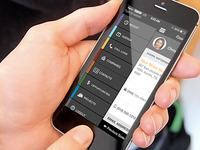 After sourcing out other CRM programs, Cosential fit best for us and the customization is great. Great customer services and easy to create indesign resumes and cutsheets from cosential. Pros: The ability to produce resumes and cutsheets from cosential in indesign format. The process to store project information and customer relations is quick and easy. Ability to customize your dashboard. Cons: That it will not round the Dollar to millions when producing a resume or cutsheet. You must go into the indesign file and edit the Dollar value. Overall: Capability to start stream lining the resume and project sheet process. Comments: Cosential provides us with a comprehensive database, allowing us to quickly access projects and data used for generating proposals, track our hit rates, follow up with opportunities, and run reports. The system has no problem managing our average workload of 75 proposals a month, 850 employees and over 6000 projects. Furthermore, Cosential makes it easy for us to efficiently store, search and retrieve the information we need. We used a different CRM system prior to beginning with Cosential, and the implementation team made our transition the easiest experience I've ever had. The team helped me successfully meet our implementation deadline, with very little complications along the way. Customer service at Cosential is personal, attentive and understanding of the A/E industry. They treat their clients like members of the development team, rather than as mere customers. The customer service rep our implementation specialist, was wonderful. Pros: The integration with Outlook is hands down a great feature. We do not have to reinvent the wheel and can continue using software that we know and understand. Overall: Ongoing Insight into our marketing and business development efforts. 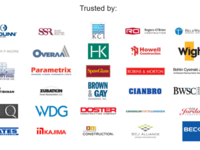 Pros: Cosential is designed specifically for the architecture, engineering, and construction industry, so it fits our needs better than any other platform I know of. It also has a lot of functionality and is customizable. I like that all of the current and future features are included so there are not hidden charges for additional functionality. Cons: Fixes to our data import do not always happen quickly. Recommendations to other buyers: This is the best platform I know of for the AEC industry. Pros: We love that it is specifically for the AEC industry, making things much more relevant to the way we do things. It is also relatively easy to used and is customizable. Cons: This may not be necessarily a Con, but there is more in this software than we need. It would also be very helpful to have a feature in the mobile app where phone calls could be recorded so you can take notes on it later. Comments: After much research, I set my last firm up with Cosential. After using other products that were ten times the price, I was surprised to find that Cosential gave me all of the features - and more - that I had gotten from similar CRM systems. As a result, I immediately implemented Cosential when I changed firms. I also incorporated Cosential into my priority-based client management system, and the solution is working wonders for my firm. We utilize it to its fullest potential, and it tackles a multitude of tasks that were previously daunting. I highly recommend Cosential to anyone. Thanks! Love it! It is already customized to fit our needs as a GC. Pros: Being a general contractor, the best part about it is that it is already customized to fit our needs. It is clear that they have studied how AEC professionals sell and procure work and have tailored the program to meet these needs. Cons: The mobile app is terrible; however, they claim to have a new one in production that should be rolled out soon. Recommendations to other buyers: If you are in the AEC industry you shouldn't look any further than Cosential. Comments: I have seen all of the solutions out there for the AEC industry. There is no one solution that does what Cosential does. They have thought through our business and created what has long been needed for everyone in our industry. This CRM system has allowed multiple companies I have worked for to organize and better utilize their data and resources. Anyone going without this system is far behind the curve. Competition has gotten fierce in today's economy, and we all need every advantage we can get. Cosential is the key to success!! Pros: I like most the Outlook add-in which makes it very simple to add and manage contacts which you establish throughout your respective industry. Good software for managing and tracking leads and relationships as well as managing marketing blasts and info out to clients and prospects. Pros: Ability to enter narrative information about a project or business lead, and to cross-reference information. Cons: There can be a lot of redundancy of information; however, I like that you can enter/use as many or few fields as you want. Recommendations to other buyers: The information is only as good a that which is entered. There needs to be a lot of monitoring for quality control/accuracy of what is entered. Just didn't work for us. Pros: A great tool to store detailed project data and fairly simple to use. Simple but time consuming to set up. Cons: My boss just never felt comfortable using it. He would much rather go to a Word document and easily find the project information to copy and paste. I'm fairly certain it cannot be integrated with accounting programs to store billing and client information. I haven't even opened the program in years. Pros: It is very easy to use and very intuitive. I like that you can suggest enhancements. The support staff is very approachable. Cons: I really like this product and cannot honestly think of anything I like least. Recommendations to other buyers: Look at the ease of use and the customer support team. Pros: I like the willingness to tailor the product to meet the specific needs of our organization. Cons: Some of the updates that have been promised were very slow to be implemented. Recommendations to other buyers: Spend your time, get a good demo team, and make sure to have management buy in. Comments: The support staff was very attentive to the many questions I have. My recent encounter with Lisa Pitts was exceptional. She went out of her way to help me solve a couple issues I was having and helped me create a report that saves me time. Thank you!! Comments: Cosential is like food to your body. You have to eat to survive. Cosential helps me to survive my daily tasks and functions of my work. I don't like to go hungry! And I don't with Cosential. Comments: Great CRM system for the A/E/C Industry at extremely competitive price. Training process takes time as the CRM comes fully loaded with features. No additional costs for add-ons. Pros: I like that it brings many aspects of company relationship together in one place: opportunities, projects, and contacts. Before Cosential, our information was in separate places. Now, it is more like a one-stop shop. Cons: Sometimes, formatting changes are made to the system that affect how my data appears (e.g., formatting bullets or paragraph spacing for resumes). Recommendations to other buyers: Be sure you understand your source data before putting it into any software like this. Comments: I appreciate the timeliness of the Cosential staff in helping our firm achieve our goals with a CRM Database. The on-boarding process could have been easier. Cosential worked with us the whole way, but I would not describe it as user friendly. Pros: I like that three offices can sync and share information easily. The contacts manager is the best feature so far. Cons: There are some limitations and entering information requires some time. After the training I was still unsure how to do a few things and it took a while to read through the training material.